Faculty from the Education Department attended the 21st Century Teaching and Learning Conference June 18-19 at The College of St. Scholastica in Duluth, MN, where we were privileged to hear noted author Lisa Delpit. Her keynote address focused on her educational experiences and information from her book, Other People’s Children: Cultural Conflict in the Classroom. This shared experience will serve as a reference point for further departmental conversations regarding preparing future teachers to support all learners. 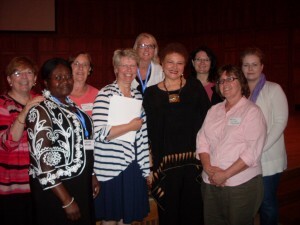 In attendance were: (left to right) Jane Schuck, Sidonia Alenuma-Nimoh, Sandi Francis, Deb Sandquist, Deb Pitton, (Lisa Delpit) Amy Vizenor, Michele Koomen, and Katrina Imison-Mazy.